Donations from America’s individuals, estates, foundations and corporations reached an estimated $373.25 billion in 2015, setting a record for the second year in a row, reports Giving USA 2016: The Annual Report on Philanthropy for the Year 2015. In 2015, the largest year-over-year percentage increase in contributions from sources however, came via grants made by the country’s independent, community and operating foundations, according to data provided by the Foundation Center. It went up 6.5 percent in current dollars, and 6.3 percent when adjusted for inflation. Over the past several years, foundations have seen strong asset growth, helping drive their ability to increase donations made in the form of grants. • Giving to educational institutions remained strong; growth exceeded 5 percent in 2015, as it also did in four of the five years between 2010 and 2014. • The giving to religion slice of Giving USA’s recipient pie chart, which measures the percentage of donations made to nine charitable subsectors, has steadily shrunk for decades. Paradoxically, it has never tumbled from its first-place standing in terms of total donations received. In 2015, the category held firm at 32 percent of the total received, the same figure estimated for 2014. • Many valuable gifts of artwork, books and manuscripts, along with other types of “appreciated assets,” were donated to charitable organizations in 2015. Since art markets both domestic and global were at or near peak highs in 2014 and 2015, that could explain why. • Giving to foundations was the only category in 2015 where donations decreased—by 3.8 percent in current dollars. Since foundations tend to receive very large gifts, it is possible their magnitude was not as great in 2015 compared to 2014, especially since those contributions influence year-over-year changes in giving. • Giving to international affairs increased 17.5 percent in 2015 after two straight years of decline. That large increase may be attributable to growth in the number of active international charitable organizations; use of more strategic fundraising methods; and increased focus on international issues among foundations. Additionally, as the slowest-growing type of charitable organization (in terms of gifts received) for six years, giving to this category may have taken longer to recover from the recession than others. For an even deeper look at charitable giving in 2015, please see “Perspectives,” an insightful look at the relationship between the data, the donations and the people who make philanthropy happen. Penned by Foundation Chair Keith Curtis, Institute Chair Jeffrey Byrne, and Lilly Family School of Philanthropy Dean Amir Pasic, it indeed puts 2015 into perspective. Advancing the research, education and public understanding of philanthropy is the mission of Giving USA Foundation, founded in 1985 by The Giving Institute. Headquartered in Chicago, the Foundation publishes data and trends about charitable giving through its seminal publication, Giving USA, and quarterly reports on topics related to philanthropy. Published since 1956, Giving USA is the longest running, most comprehensive report on philanthropy in America. Read more about Giving USA Foundation's history, as well as the history of Giving USA and philanthropy in the U.S. in the Giving USA 2015 Spotlight: Celebrating Service to Philanthropy (available as a free download). The Giving Institute, the parent organization of Giving USA Foundation™, consists of member organizations that have embraced and embodied the core values of ethics, excellence and leadership in advancing philanthropy. Serving clients of every size and purpose, from local institutions to international organizations, The Giving Institute member organizations embrace the highest ethical standards and maintain a strict code of fair practices. 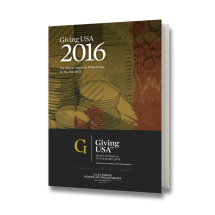 Giving USA 2016: The Annual Report on Philanthropy for the Year 2015, is available for download at our online store. A complimentary executive summary, Highlights, also is available. Giving USA Foundation periodically publishes in-depth reports (Spotlights) on different aspects of charitable giving and fundraising trends. Giving USA estimates primarily rely on econometric methods developed by leading researchers in philanthropy and the nonprofit sector and are reviewed and approved by the members of the Giving USA Advisory Council on Methodology (ACM). Members of the ACM include research directors from national nonprofit organizations, as well as scholars from such disciplines as economics and public affairs, all of whom are involved in studying philan¬thropy and the nonprofit sector.